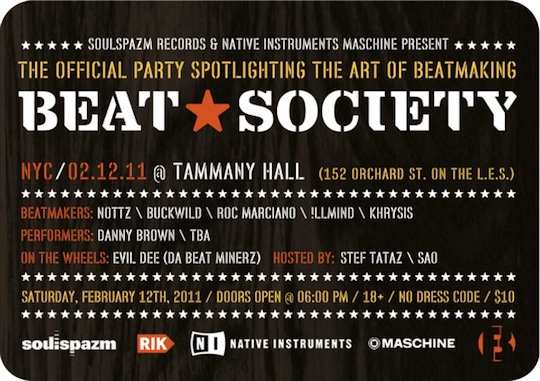 Beat Society returns this February for an NYC edition featuring producers Nottz, Illmind, Roc Marciano, Buckwild, and Khrysis. With Evil Dee of Da Beat Minerz on the turntables, it’s sure to be a good event. Visit Beat Society for more info. Wish I could make this. I hope that Saturday I can get off work to check this out, I’m very interested to see wassup. WOW! A couple of the illest producers in hip hop right now. Wish I could make this but I live in Ca. Roc Marci had to cancel due to a schedule conflict with the recording of his new album. We have replaced him with DJ Revolution. Tickets online or at the door?? peace be on to you ! its probably gonna sell out early! Shall be there 4 sure..
Im gonna be there like swim-wear mother fuckas.